Lindsey Vonn had to be carried off the mountain after crashing in Saturday’s World Cup super G. On Wednesday she announced she’s done racing for the season (NBC Sports). Vail’s Lindsey Vonn announced on Instagram Wednesday that she is done ski racing for the season, calling it quits after a knee injury last weekend that had fans of her chief rival for the overall World Cup title accusing her of faking the injury. 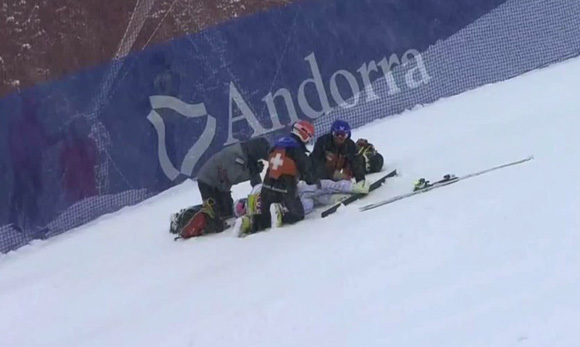 Vonn crashed near the bottom of a World Cup super-G course in Soldeu-El Tarter, Andora on Saturday, and was taken off the mountain in a sled after a long delay. Switzerland’s Lara Gut, right behind Vonn in the overall World Cup chase, was held up at the top of the mountain as snow continued to fall, but eventually raced and finished 16th, cutting Vonn’s lead to just eight points. On Sunday, Vonn wore braces on both knees and bounced back in the combined event (one run of super-G and one run of slalom) to finish 13th and increase her lead to 28 points over Gut, who straddled a gate in the slalom and failed to finish. Gut fans trolled Vonn on her Facebook account, accusing her of overstating or even faking the knee injury to freeze Gut at the top of the hill while course conditions worsened. Afterward, Vonn revealed that an MRI showed a hairline fracture in her left knee. On Wednesday, Vonn said on Instagram that the injury was even more severe than that original prognosis and not nearly stable enough to continue racing on as she sought to finish out the season and claim her American record fifth overall title. She already holds the record with four (no other American has won more than three since Phil Mahre did it in the 1980s). Gut now is virtually assured the overall title.